Day 46, Peebles to Rosehill. Todays walk is shown on the OS map as a "Dismantled Railway" and came complete with long, old (pitch black) tunnels, bridges (some destroyed), an intact viaduct & a station platform. The problem is that a lot of the land has been sold off and we encountered endless "private keep out" signs, barbed wire, locked gates and all sorts of clever ways to make the walkers life a misery. The only trick that they missed were the land mines! The little buggers didn't win though as we are now just 5 miles south of Edinburgh and the invasion is planned for tomorrow ~ we have now walked 760 miles! 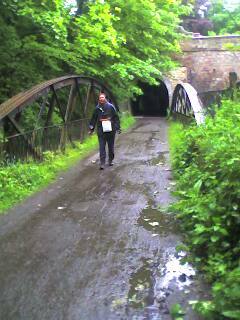 Day 47, Rosewell to Queensferry. 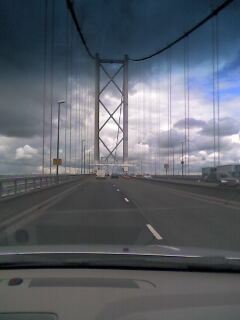 We have reached the Forth Bridge. Walking through Edinburgh was very odd after so long in the countryside. This was the first day since Lands End that we didn't see a postie and the first time that I have used a pedestrian crossing or heard a police siren or experienced rush hour ~ it really felt strange! 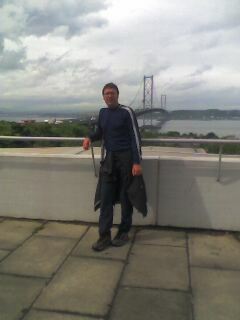 Day 48, Queensferry to Aberdour. 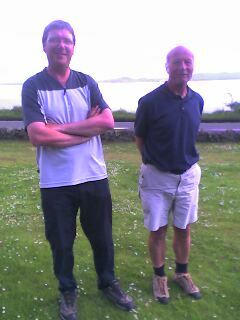 Edinburgh can just about be seen behind us in the far distance ...it's 25 miles "down south" from today's finish point. Day 49, A frustrating day off! This Photo tells the tale of our day. On the only day of our E2E without a support driver, we awoke to a flat & unusable tyre and re-crossed the Forth Bridge in an all day search for a new (£200!) tyre. We then pitched our tents and enjoyed the thunderstorms! !! !Click on the links above to go to the relevant day!! !